Whole Foods will open a distribution center in Pullman. CHICAGO — Whole Foods plans to open a distribution center in Pullman, creating at least 150 jobs. The City Council is considering allocating $7.4 million in TIF assistance to help cover development costs, according to a city news release. The center won't serve as a grocery store, but it will distribute groceries to 70 stores in the Midwest and Canada, according to a Whole Foods new release. The 140,000-square-foot Pullman center will replace one in Indiana and will employ 150 people. “This distribution center is another example of Whole Foods doubling down on Chicago’s South Side and adds to the renaissance that is happening in Pullman,” said Mayor Rahm Emanuel. “Neighborhood investments like these — from stores in Hyde Park and Englewood to this distribution center in Pullman — will be vital community anchors and open up more avenues of opportunity for all Chicagoans." The center is part of Whole Foods' "commitment" to the city, said CEO Walter Robb. 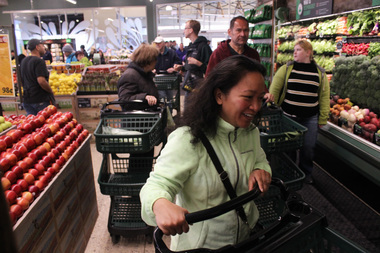 The grocery chain is also building stores in Englewood and Hyde Park.